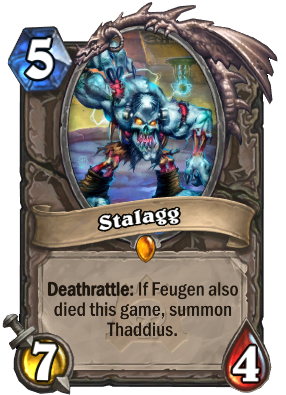 Deathrattle: If Stalagg also died this game, summon Thaddius. 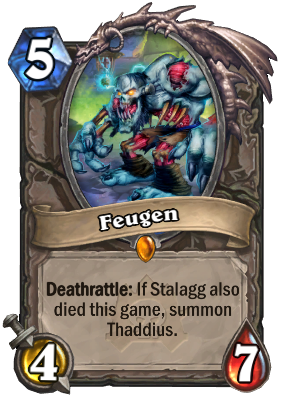 Feugen is sad because everyone likes Stalagg better. 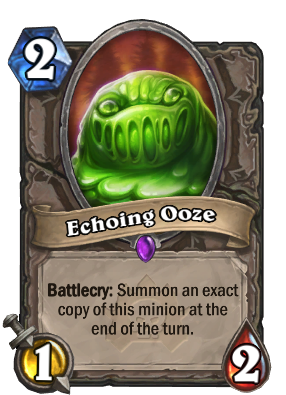 Battlecry: Enemy spells cost (5) more next turn. 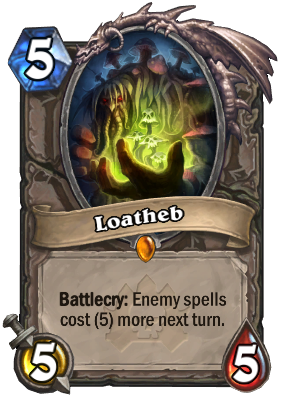 Loatheb used to be a simple Bog Beast. This is why we need stricter regulations on mining and agriculture. 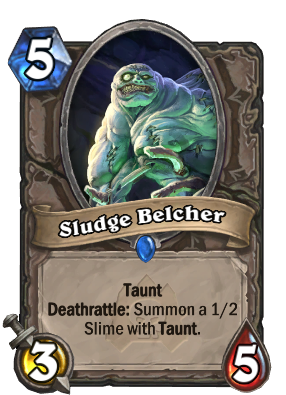 Deathrattle: Summon a 1/2 Slime with Taunt. DO NOT GIVE HIM A ROOT BEER. 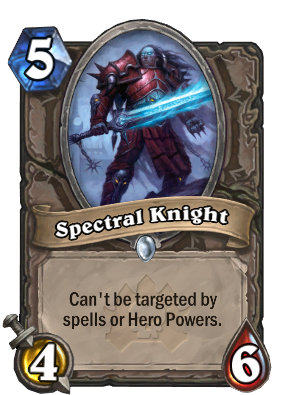 What do Faerie Dragons and Spectral Knights have in common? They both love pasta! 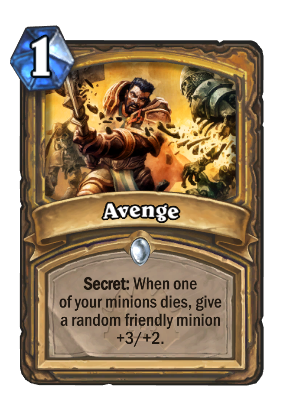 Stalagg want to write own flavor text. "STALAGG AWESOME!" 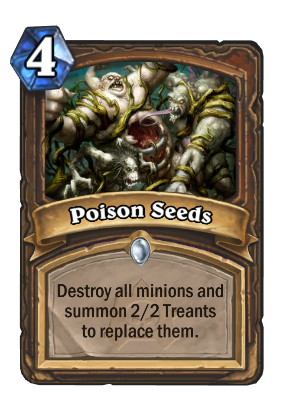 Destroy all minions and summon 2/2 Treants to replace them. 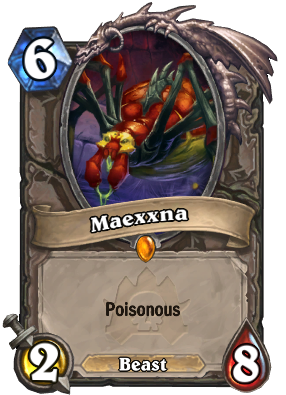 "Poisonseed Bagel" is the least popular bagel at McTiggin's Druidic Bagel Emporium. 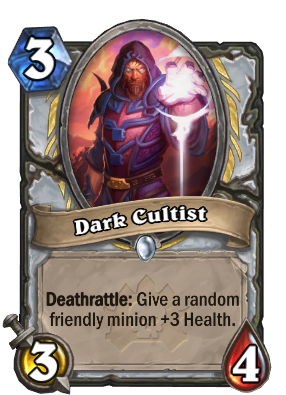 Deathrattle: Return a random friendly minion to your hand. 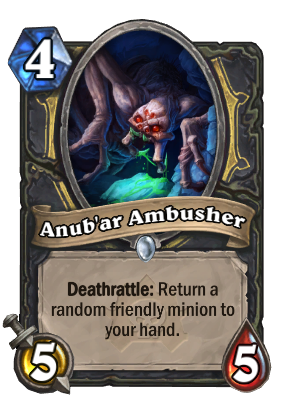 Originally he was called "Anub'ar Guy who bounces a guy back to your hand", but it lacked a certain zing. 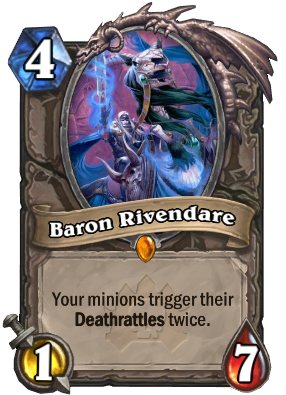 Your minions trigger their Deathrattles twice. 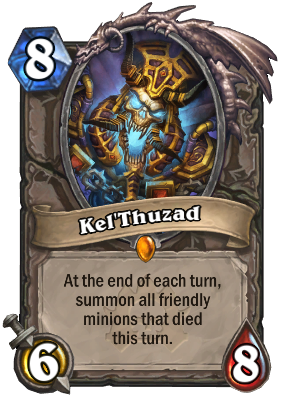 There used to be five Horsemen but one of them left because a job opened up in the deadmines and the benefits were better. This soul just <i>wails</i> on you. 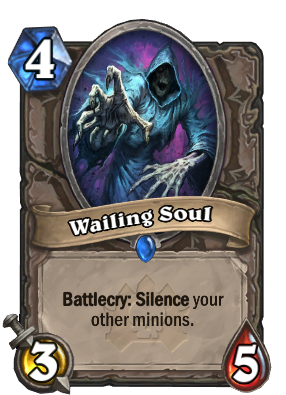 Dang, soul, let up already. 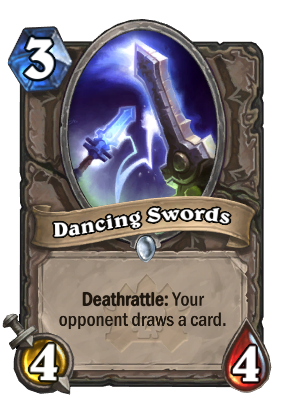 Deathrattle: Your opponent draws a card. They like to dance to reggae. Taunt. 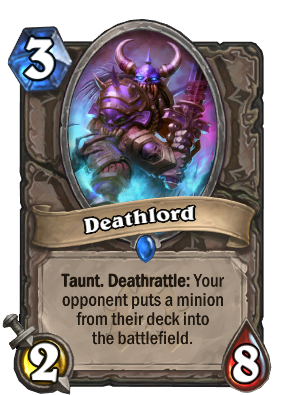 Deathrattle: Your opponent puts a minion from their deck into the battlefield. Stealth. 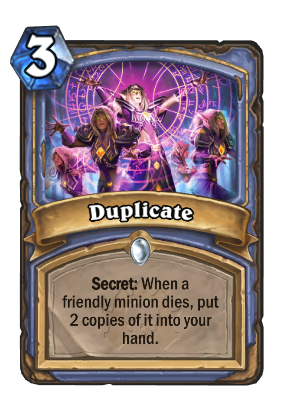 At the start of your turn, gain +1/+1. 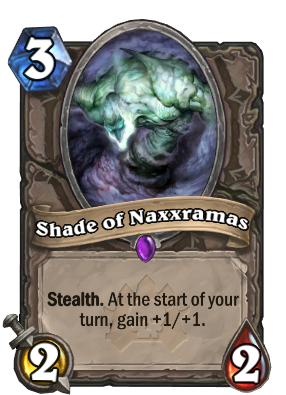 The Shades of Naxxramas <i>hate</i> the living. They even have a slur they use to refer them: <i>Livers</i>. 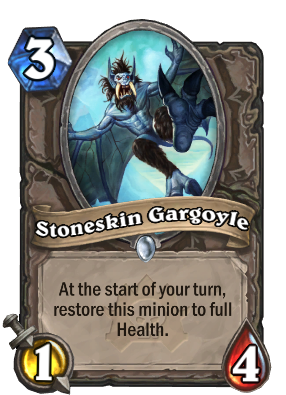 Stoneskin Gargoyles love freeze tag. 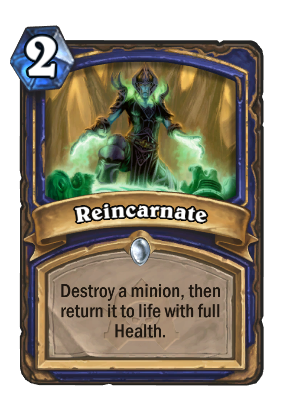 Destroy a minion, then return it to life with full Health. 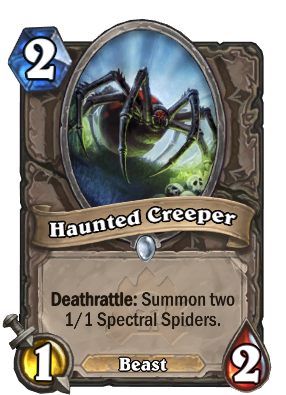 It's like birth, except you're an adult and you were just dead a second ago. 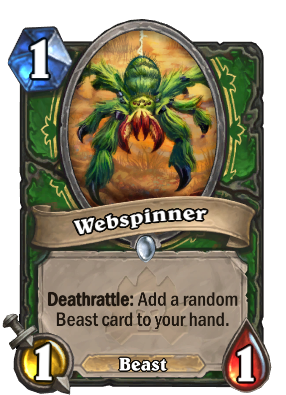 Arachnofauxbia: Fear of fake spiders. 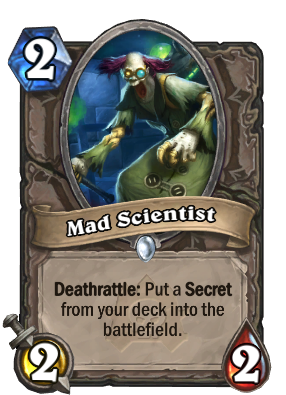 His mother wanted him to be a mage or a warlock, but noooooooo, he had to go and be a scientist like his father. 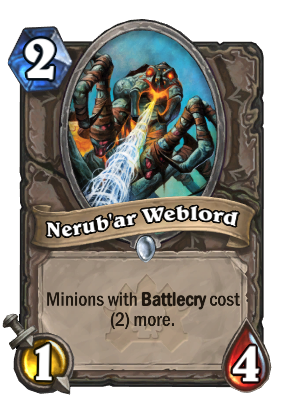 Deathrattle: Summon a 4/4 Nerubian. 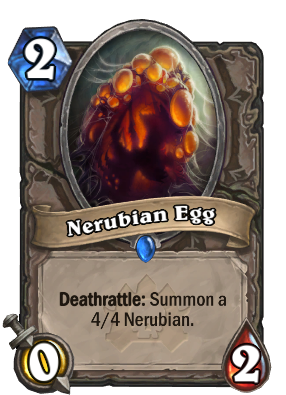 Eggs are a good source of protein and Nerubians. Taunt. 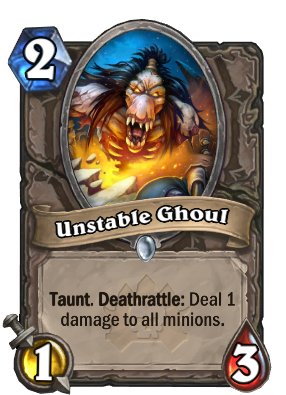 Deathrattle: Deal 1 damage to all minions. Filling your Ghouls with Rocket Fuel is all the rage at Necromancer school. 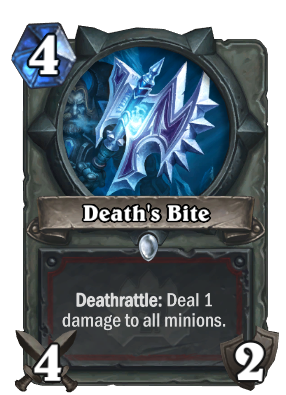 Whenever you summon a minion with Deathrattle, gain +1 Attack. 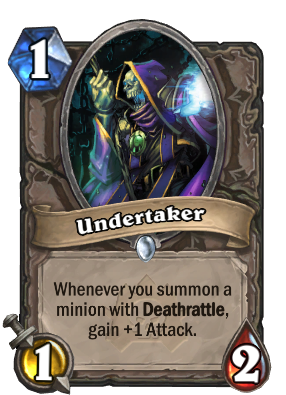 In a world where you can run to a spirit healer and resurrect yourself, Undertakers do pretty light business. 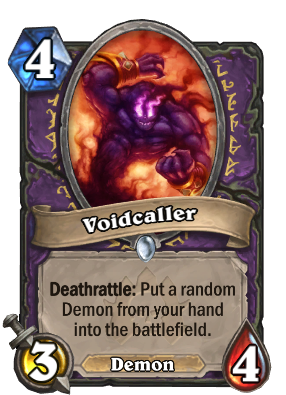 Deathrattle: Add a random Beast card to your hand. Spider cocoons are like little piñatas! 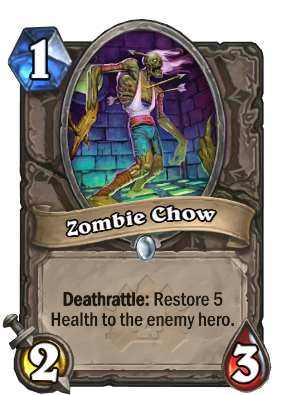 Deathrattle: Restore 5 Health to the enemy hero. Zombie. It's what's for dinner.